Below are the finalized 2019 defined standard Medicare Part D prescription drug plan parameters as released by the Centers for Medicare and Medicaid Services (CMS), April 2018. » PDP-Compare: How did each 2018 Part D Plan Change in 2019? 2019 Medicare Part D Late-Enrollment Penalties will decrease by 5.23% - But maximum penalties can reach $601 per year. Here are a few highlights of the defined standard Medicare Part D plan changes from 2018 to 2019. The chart below shows the changes in defined standard Medicare Part D design for plan years 2015, 2016, 2017, 2018 and 2019. The CMS "Part D Benefit Parameters for Defined Standard Benefit" is the minimum allowable Medicare Part D plan coverage. However, CMS does allow Medicare Part D plans to offer a variation on the defined standard benefits (for example, a Medicare Part D plan can offer a $0 Initial Deductible). begins once you reach your Medicare Part D plan’s initial coverage limit ($3,820 in 2019) and ends when you spend a total of $5,100 out of pocket in 2019. Part D enrollees will receive a 75% Donut Hole discount on the total cost of their brand-name drugs purchased while in the Donut Hole. The discount includes, a 70% discount paid by the brand-name drug manufacturer and a 5% discount paid by your Medicare Part D plan. The 70% paid by the drug manufacturer combined with the 25% you pay, count toward your TrOOP or Donut Hole exit point. Medicare Part D beneficiaries who reach the Donut Hole will also pay a maximum of 37% co-pay on generic drugs purchased while in the Coverage Gap (receiving a 63% discount). For example: If you reach the 2019 Donut Hole, and your generic medication has a retail cost of $100, you will pay $37. The $37 that you spend will count toward your TrOOP or Donut Hole exit point. (3) The Catastrophic Coverage is the greater of 5% or the values shown in the chart above. In 2019, beneficiaries will be charged $3.40 for those generic or preferred multisource drugs with a retail price under $68 and 5% for those with a retail price greater than $68. For brand-name drugs, beneficiaries would pay $8.50 for those drugs with a retail price under $170 and 5% for those with a retail price over $170. (4) This amount includes the $1,500 per person burial allowance. The resource limit may be updated during contract year 2018. 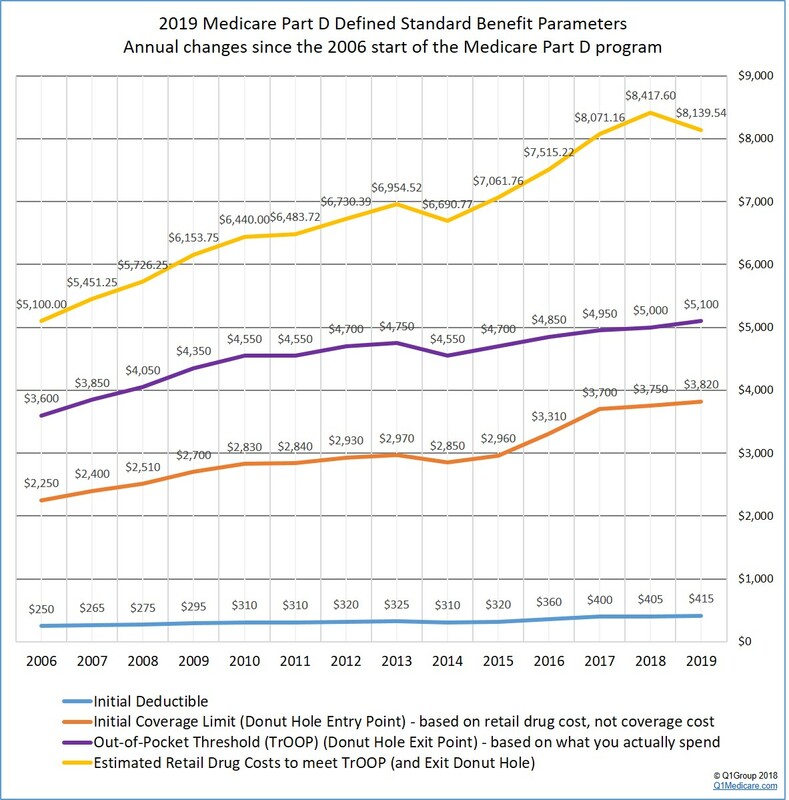 The graph below shows the finalized Medicare Part D defined standard benefit parameters. The LIS qualifications using the 2019 Federal Poverty Level (FPL) guidelines are shown below. If you do not currently receive Extra Help but meet the 2019 income and asset qualifications, please apply for Extra Help at https://secure.ssa.gov/i1020/start. You could receive Extra Help for the remainder of 2019, even if your income or assets no longer meet the requirements later in the year. If your income is below 135% of the FPL ($16,861.50 if you are single or $22,828.50 for married couples), you could qualify for the full Low Income Subsidy (resource limits also apply - see chart above). Even if you don’t qualify for full LIS benefits, you could be eligible for partial LIS benefits if your income level is at or below 150% FPL (resource limits also apply - see chart above). Remember, the LIS subsidy helps to pay both your monthly plan premiums and drug costs. Learn more in our article, 2019 Federal Poverty Level Guidelines (FPL): 2019 LIS Qualifications and Benefits. Click here for additional family member figures. Learn more about the Extra-Help program.